New England K-9 School for Dogs located in Hopkinton, MA has served customers throughout the entire New England area since 1973. We specialize in canine obedience and professional grade training for hunting, search and rescue, and protection. Our certified trainers uphold the highest standards of the U.S. Professional Dog Trainers Association, the American Kennel Club, and other leading organizations. Head trainer, Sol Oven has been training dogs professionally for over 40 years. In addition to his experience training thousands of dogs throughout his career, Sol trains dogs for American Kennel Club Competitions, served as a Liaison for the Central Massachusetts Disaster Animal Response team, and was honored for his animal relief efforts in the wake of hurricane Katrina. 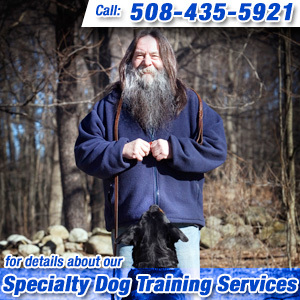 Contact New England K-9 School for Dogs today at 508-435-5921 to speak to a trainer about an appointment for your dog, or continue to browse our website for more information on our obedience training. Also be sure to visit our testimonials page to see what others are saying about us!